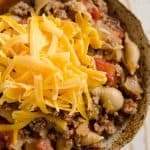 Pressure Cooker Light & Spicy Taco Shells are a quick and easy 20 minute recipe loaded with lean hamburger, taco seasoning and veggies for a healthy and family-friendly dinner made in your Instant Pot! 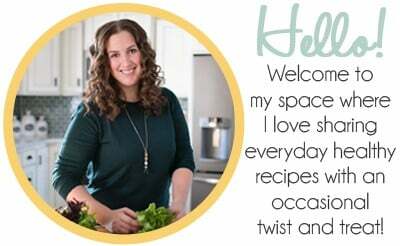 I have been having lots of success with my Instant Pot lately and I am very excited about it! 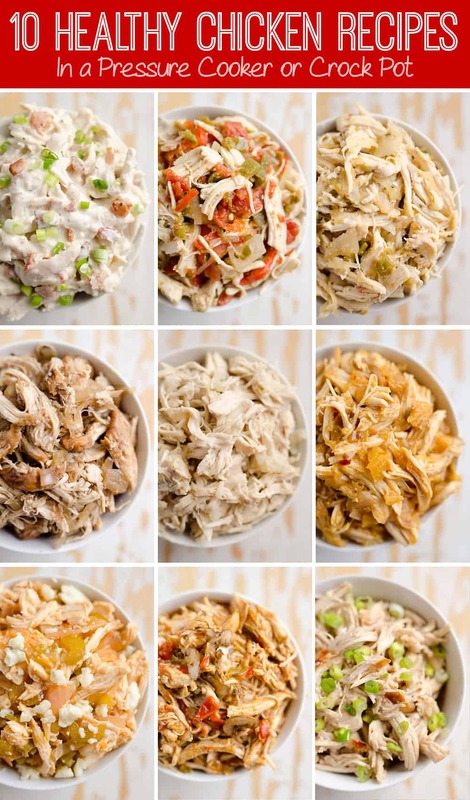 From my favorite Thai Peanut Chicken & Noodles to these Pressure Cooker Light & Spicy Taco Shells, there are so many amazing and healthy meals you can quickly make in one easy pot! I have literally made this dinner every weekend for the last three weeks! 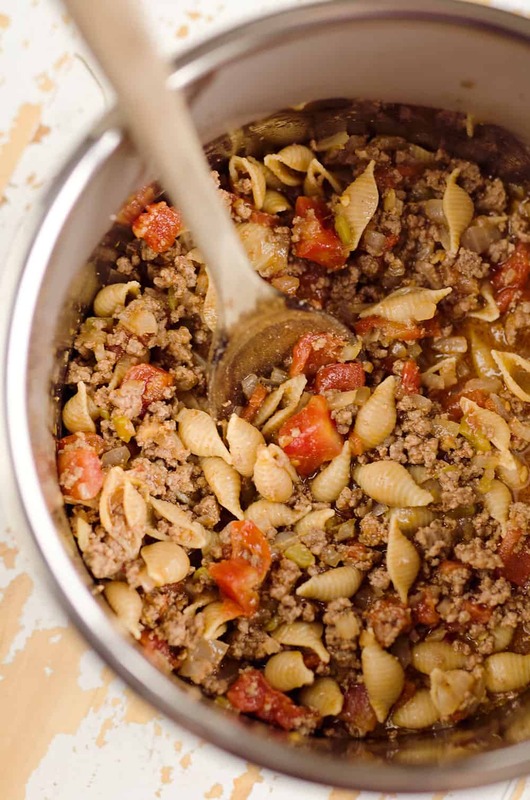 Not only is it a great last-minute dinner idea, but it makes for amazing leftovers for lunch throughout the week. 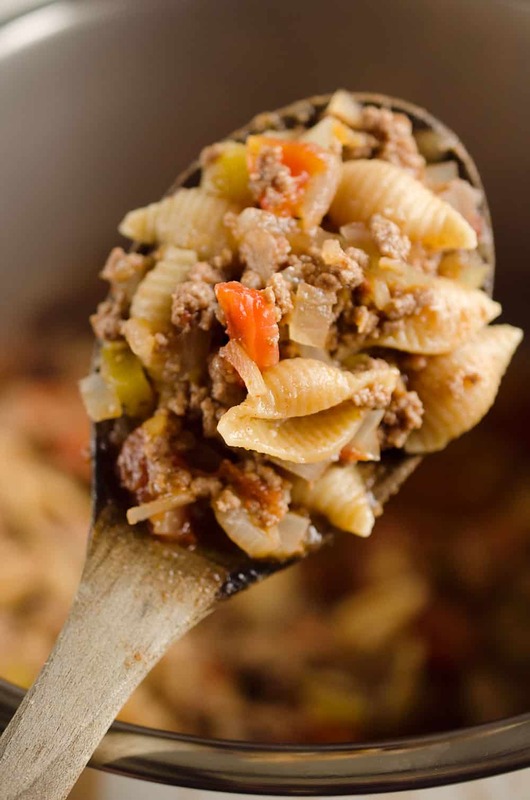 With lean ground beef, vegetables and whole wheat pasta shells, it’s a wholesome meal you can feel good about making again and again. 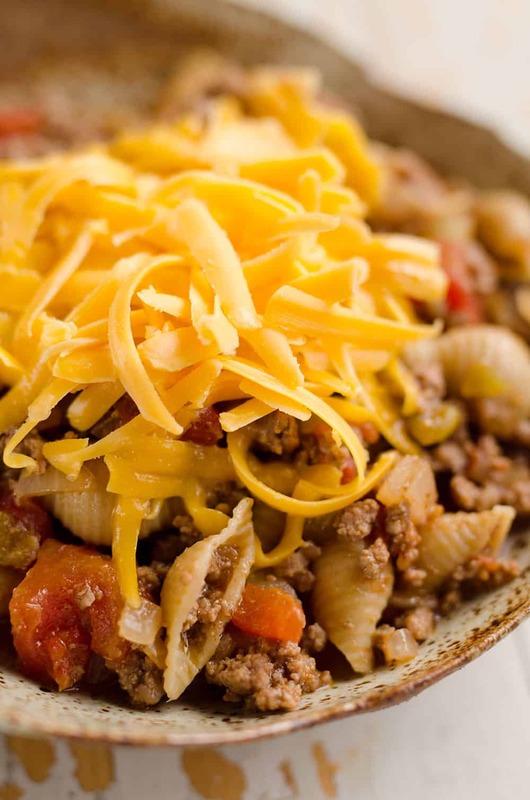 You can keep this meal extra light by passing up the shredded cheese on top, which I often do for lunches. 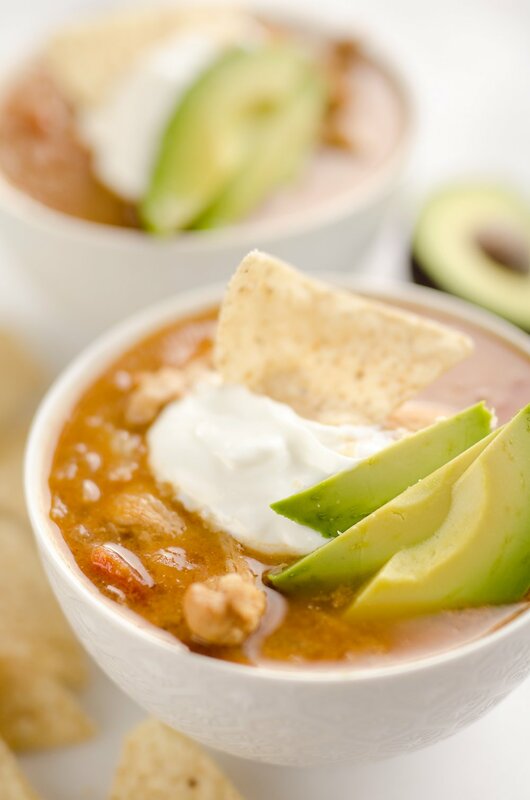 Otherwise, you can indulge with a little extra sharp cheddar for an added kick of flavor and creaminess. 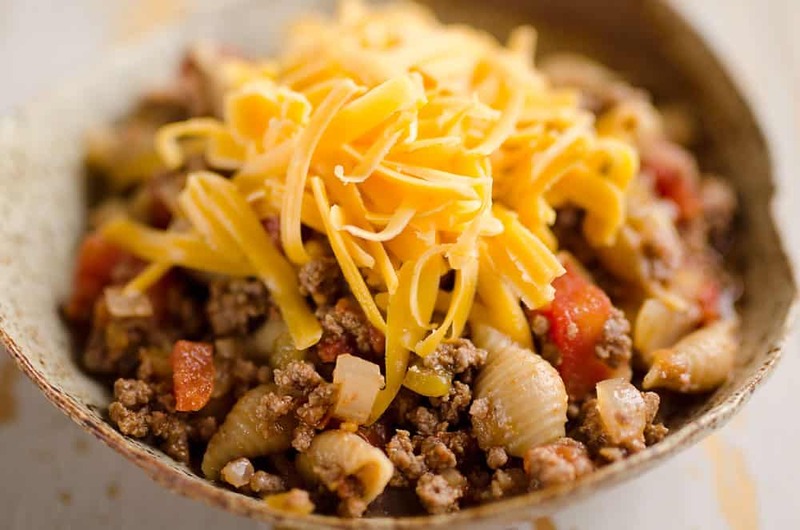 Top your bowl with a little freshly shredded cheese or mix it into the pot after you open it to incorporate it into the mix. Either way, you won’t be disappointed! 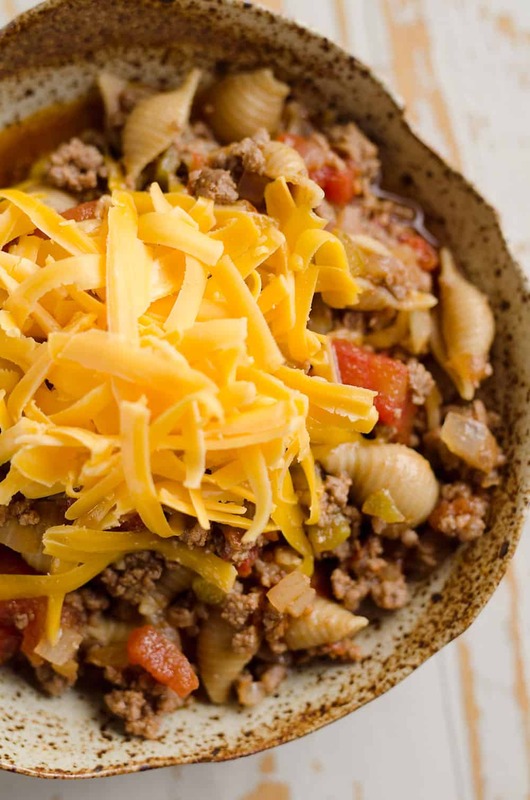 Do you have any amazing Instant Pot meals that are must-trys? If so, I’d love for you to share with me below in the comments! I can’t get enough of just how easy and delicious everything coming out of my pressure cooker is these days. Set your 5 or 6 quart electric pressure cooker to saute and add the hamburger, onion and jalapeño. Break up the hamburger and saute for 4-5 minutes so meat is lightly browned. Press cancel. Add the salt, taco seasoning, chili powder and garlic powder to the meat and give a quick stir. Add the pasta shells and top with the water and fire roasted tomatoes with the juice. Lock the electric pressure cooker lid in place and manually set to 5 minutes on high. Press start. When the time is up, quick release the pressure using an oven mitten to release the pressure nozzle. Serve topped with shredded cheddar and sour cream. 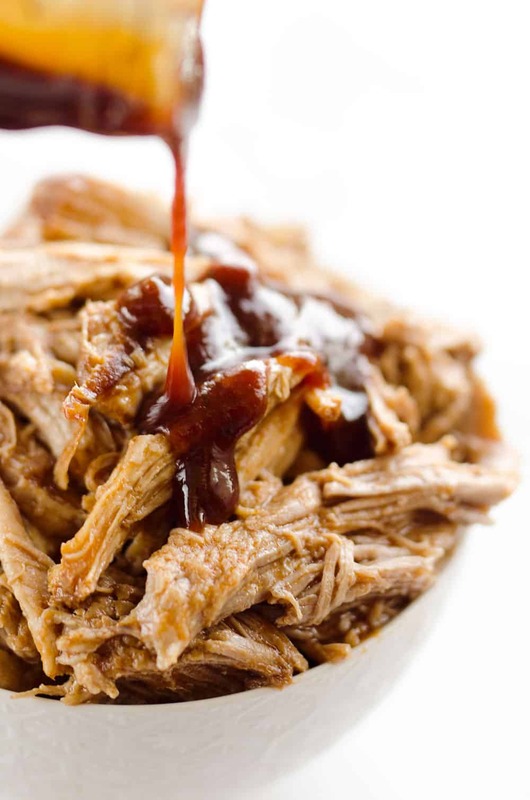 More great recipe ideas for your Instant Pot! This was so so good! We made it last night and my family was demanding more. Thanks for a great receipe!! Happy to hear your family loved it Amber! Can you make this recipe with chicken breast instead of beef? Maybe cut breast into small equal parts? Maybe have to cook longer? Thank you! Love the beef but would like to have chicken sometimes. I haven’t tried it, but I would try saute up pieces of chicken until half way cooked through and then add a splash more of liquid to make up for the liquid the beef would be giving off.